In my last post I talked about how I like to go outside and stand barefoot on the earth. How it grounds me. And then I came across this. 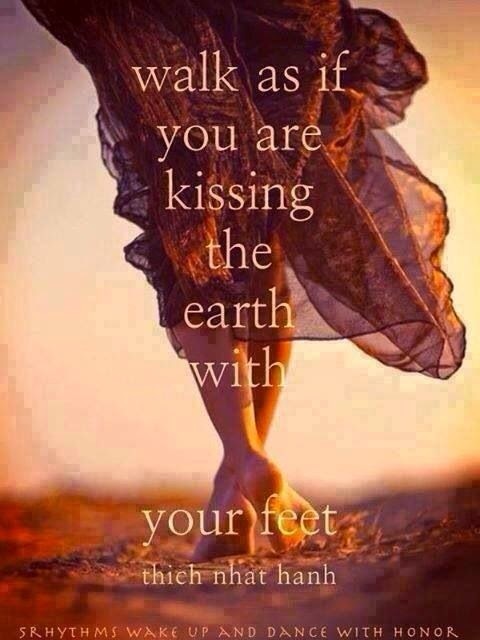 So now when I stand barefoot on the grass I do imagine my feet are kissing the earth. I send love into the earth and pull love back up into my body. It is a wonderful healing feeling. Please join me tonight and tomorrow for Women Speak. We will be talking about aging as a single woman. Such a pretty image and thought, Laura! I am a barefoot kinda of girl, too! I just now realized that I haven't placed my footprint in the sand on the beach this Summer I better get "er" done, and soon! Great image and special message. Thanks for sharing this.